To convince patients they will receive the advanced dental care needed to keep them looking and feeling their best, you need a website that symbolizes a commitment to using the latest technology possible. 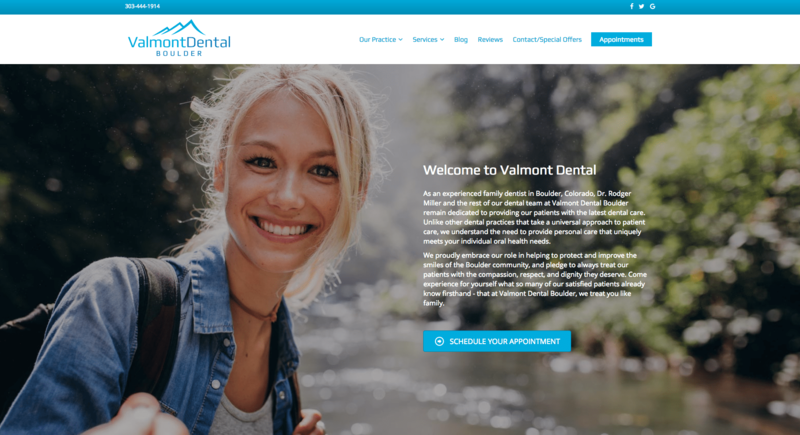 When Valmont Dental Boulder asked Local Fresh to bring a new approach to their website, we created a responsive design that both easily allows patients to access the information they need, while also providing an advanced atheistic that works to symbolize the state-of-the-art care offered by Dr. Rodger Miller and his staff. From rotating patient reviews to up-to-date special offers, Valmont Dental Boulder’s website keeps patients educated, informed, and engaged.